Zweibrücken, Germany (4 March 2015) – At Plast Milano (5-9 May 2015), Pallmann will be highlighting the benefits of its PolyGrinder® system, type PMM 300, for the pulverization of thermoplastics for masterbatch- and compounding operations under ambient temperature. The system is suited for processing large production amounts up to 650 kg/h as well as for the production of small charges. It is used for producing the best powder qualities from PVC and polyethylene as well as difficult and heat-sensitive materials such as EVA, polypropylene, polyamide, polyester, polycarbonate for masterbatch, compounding and rotomolding operations. The product is pulverized at ambient temperature without the addition of cooling agent such as liquid nitrogen. Thanks to a new, almost maintenance-free drive concept, easy cleaning of the interior and the quick and precise adjustment of the grinding gap, the mill operates very economically. The produced powders have excellent mixing and flowability characteristics. The installation does not have a base frame and therefore a compact design, so that the mill can be integrated simply into existing production lines. The interior of the mill has very smooth surfaces without dead zones and corners, in which material can stick and/or remain. Material is discharged from the side into a cyclone and collected in bags, containers or can even be conveyed to the next production step. Also at Plast Milano, Pallmann will present the newest generation of its PFV Plast-Agglomerator. With this unit, thermoplastic waste can be recycled and reintroduced into the production stream. The equipment is characterized by its relatively low acquisition cost in comparison with other technologies, as well as the low thermal stress it puts on materials, allowing them to maintain as many of their original characteristics as possible. The PFV Plast-Agglomerator can handle waste coming from production of film, fibers, foam, carpets or other mixed materials, from PP, PE, PVC, ABS, and XPS as well as compounded materials. It brings also many advantages when processing sensitive materials such as, for example, PLA. In the Plast-Agglomerator, waste precut into 8-10 mm pieces is gently plastified by means of frictional heat, pressed through a die and cut at the outer circumference by rotating knives. The agglomerated material is transported pneumatically to a downstream hot melt granulator, creating free-flowing granules with a high bulk density and a minimum of thermal degradation. This valuable raw material can then be reintroduced into the production process or used in other applications, as a filler for example. 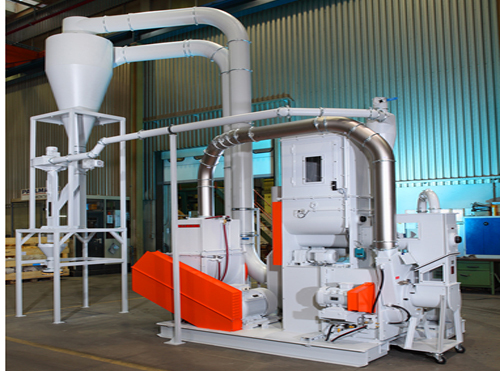 New technical characteristics make the Plast-Agglomerator even more attractive than before. Pallmann can now deliver complete modular systems, premounted on a base frame, including wiring and water hook-up, simplifying installation and decreasing assembly time. Even after assembly, the complete system can be quickly moved and so is easily adaptable to changing production conditions at the customer. To facilitate processing of abrasive materials such as carpet waste, the die and the agglomerating vane are equipped with a specially developed wear resistant coating. The result is a considerably increased lifetime of the agglomerating elements as well a reduction in unproductive downtime that occurs during replacement of worn parts. Founded in 1903 as an engineering works, Pallmann is a medium-sized family-owned enterprise that has a history covering seven generations of millers and millwrights. Now a global company, the PALLMANN Group has specialized in size reduction and processing technology in various sectors. With over 100.000 installations worldwide and more than 1000 machine types in what is the world’s largest range of size reduction equipment for all materials ranging from soft to medium-hard, brittle to tough, as well as fibrous products.